What is the life expectancy of a health guru? Let's just take a random sample. Robert Atkins, the man who persuaded millions to eat bread-free sandwiches: dead at 72. Would he have slipped on that ice if he'd had a proper meal? Jim Fixx, the man who tried to get America jogging: kicked the bucket at 52 from a heart attack during his afternoon run. Michel Montignac, bestselling author of Eat Yourself Slim ... and Stay Slim! : shuffled off this mortal coil at 66. 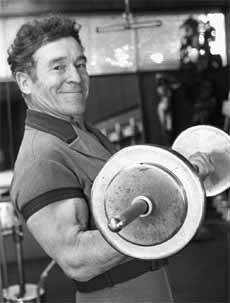 But then, this January, Jack LaLanne, the 'godfather of fitness', died at the ripe old age of 96. Finally, we have a guru who looks like he could have been right. Balanced and less food key to longevity. Could the way LaLanne led his life be the way we should be leading ours? Should we all start living the Jack LaLanne lifestyle? It isn't an easy one to follow. At the age of 15 and living in Oakland, California, LaLanne was a junk-food junkie. His father had died of a heart attack at the age of 50 and the unruly, unhealthy adolescent looked to be heading the same way. He was also beset by behavioural problems, having attacked his brother with an axe, tried to set fire to the family home and been expelled from school. In desperation, his mother took him to a talk by Paul Braggs, the 'wellness guru' (who, by the way, made it to 81, though he claimed he was 95). The talk had an effect and LaLanne turned his life around. "I was psychotic with sugar," he recalled. "But I got off it, became a strict vegetarian, started juicing, taking brewer's yeast, going to the YMCA." Within a year, he had become his school's star athlete and, at the age of 19, won a contest for the World's Best Built Man. He went on to open one of the world's first health clubs and became a household name in the 1950s with the Jack LaLanne Show. He also performed a series of audacious stunts, such as swimming from Alcatraz Island to Fisherman's Wharf in San Francisco towing a half-tonne boat. While wearing handcuffs. Lalanne, who spent two hours everyday exercising, at his health club. To live the LaLanne lifestyle, the first thing to do is give up red meat, particularly if it's processed. Or, as LaLanne himself put it: "If man made it, don't eat it." Prepare to eat a lot of vegetables, particularly raw, juiced ones. But is there any evidence that carrot juice will make you live for ever? "We are not aware of anyone who has done a specific longevity study," admits Liz O'Neill, of the Vegetarian Society. "But there are studies which show that vegetarians as a group have a lower incidence of obesity, heart disease, high blood pressure and type-2 diabetes. It's no surprise to us that LaLanne, with his carefully balanced, vegetarian diet, lived a long life. 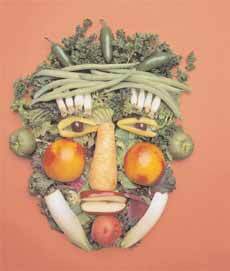 "Vegetarianism is a great way to avoid some of the common killers. It's not a panacea but it certainly helps." "Is it worth living to 96 if you can't eat a nice filet mignon?" I ask, quite reasonably, I think. "Is it worth living at all if you have blood on your hands?" replies O'Neill. Brace yourselves for lentils...Nevertheless, Britain's oldest man, the 108-year-old Rev Reg Dean, is a vegetarian. George Bernard Shaw, who lived to 94, was a vegetarian. Luigi Cornaro, the Venetian nobleman, gave up meat at 35 after almost dying of Renaissance red-meat excess. He lived for a further 64 years-not a bad innings for the 16th century. This is all anecdotal. I bet we could find some young, dead vegetarians if we looked. Time for a brutally objective scientific view. Timothy Key, a professor of epidemiology at Oxford University, is a leader in the European Prospective Investigation into Cancer and Nutrition. He has spent years studying the relationship between vegetarianism and longevity, so if anyone can say whether you're more likely to live longer if you give up sausages, it's him. But he can't. "Using the most up-todate data we've got, there's little or no difference between vegetarians and non-vegetarians in total causes of death," he says. "The understanding of the effect of diet on health is really not very good. We know about vitamin deficiencies, but beyond that it has proved more difficult to work out how diet affects major things such as heart disease and colon cancer. If there was some huge effect, we would have picked it up. There are so many diseases for which there is no data-dementia, Parkinson's, multiple sclerosis. Being a vegetarian could be really good or really bad for several of those, but we just do not know. Nobody does." Professor Brian Kirby, a pioneering doctor in the prevention of heart disease and co-author of the book How to Live to 110, says we don't have to give up red-meat. He is of the "all things in moderation" school of longevity, and suggests that the single-most important thing LaLanne did to make it to 96 was to steer well clear of cigarettes. "There are lots of other vices you can take up in life that are far less risky than smoking," he says, before refusing to tell me what they might be. "You name the disease, smoking stands as the main culprit. "LaLanne should certainly be praised for getting people to think about their bodies, but he spent two hours a day doing physical activity. Most of us struggle to find even half an hour. And he was focused on musclebuilding. That was successful for him, but for most people the benefits of exercise come from the more mundane things, such as taking the stairs instead of the lift. Trying to exercise like him is going over the top." One of LaLanne's many mottos was "If it tastes good, spit it out." For breakfast, he ate hard-boiled egg whites, a cup of broth, oatmeal with soy milk and seasonal fruit. For dinner, he ate raw vegetables, egg whites and, for a treat, a piece of fish or a roast turkey sandwich. "Do you know how many calories are in butter and cheese and ice cream?" he once asked. "Would you get your dog up in the morning for a cup of coffee and a doughnut?" Mercifully, Kirby does not advocate such limitations. He points out that there are plenty of things that taste good but are also nutritious. We can even have the odd doughnut. And we don't have to do two hours of weights every day before breakfast, either. That's the good news. The bad news is that we still have to get the basics right. "A lot of people are still smoking. A lot of our calorie intake is still from alcohol. Many of us aren't looking at what we're eating. And it's no good signing up for the gym and deciding one month later that you've had enough," he says, as if he knows that I've just cancelled my gym membership. "You have to find a way in which you can take that activity all through the year. If you do all those things, you will have a better chance of living a long life. "Because people don't die of old age; they die of disease. They die of things to do with rotting their blood vessels, they die of coronary disease, they die because they have been overwhelming their systems with carbohydrates and saturated fats." So LaLanne was right? We have to eat more fruit and vegetables? I should go out right now and buy a juicer? "There's a lot to be said for juicers," says Kirby, "but the main thing is that you're eating vegetables. You don't have to juice them." So there you have it. LaLanne, the man Arnold Schwarzenegger described as 'an animal' after he beat him in a bodybuilding competition, might have lived to 96, but we don't have to copy him. We do, however, have to have our five a day, at the very least. Sorry.